DIE Mercurii, 3 die Augusti. Message from the H. C. with an Order for 27,000l. to Mr. Loftus, for Ireland. and Instructions for executing the Derby Militia. Letter from the Earl of Warwick, with a Servant of L. Digby's, whom he took. L. Mayor, etc. to attend Tomorrow. Committee to examine the Proceedings of the Commissioners of Array. Indemnity for those who apprehended Sir Lewis Dyves. Order for 27,000l. to Mr. Loftus, for Ireland. Order for 5000l. more to him, for the L. Lieutenant's incidental Charges. Instructions for the Committee going into Darbyshire. Agreed to, for the Twenty-seven Thousand Pounds. But for the Five Thousand Pounds, this House will consider of it until the Lord Lieutenant be at Chester. Ordered, That this House agrees with the House of Commons in these Instructions. That this House agrees in the Instructions, and the Order for the Twenty-seven Thousand Pounds; but will send an Answer, by Messengers of their own, concerning the Five Thousand Pounds. From aboard The James, in The Downes, 31 July, 1642. Ordered, That the Lord Digbie's Man shall be examined; in the mean Time, to be put into the safe Custody of the Gentleman Usher's Hands. Ordered, That the Lord Mayor shall (fn. 1) not attend, with his Counsel and his Witnesses, until To-morrow Morning, at Nine of the Clock. 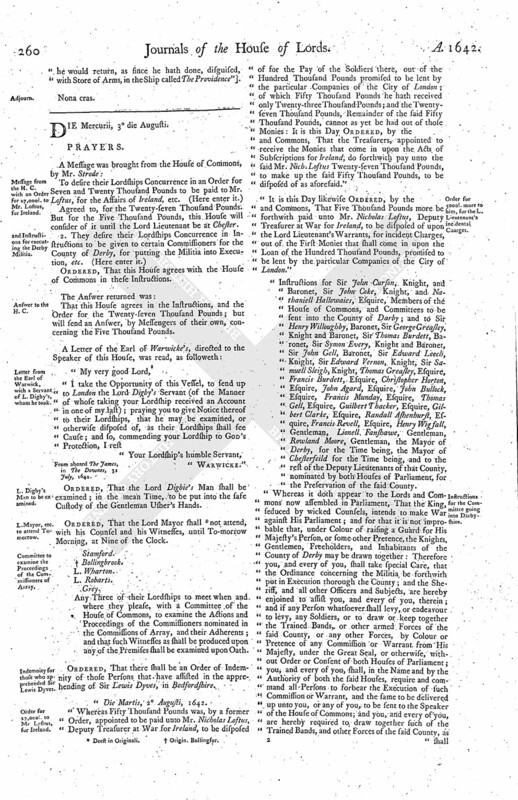 Any Three of their Lordships to meet when and where they please, with a Committee of the House of Commons, to examine the Actions and Proceedings of the Commissioners nominated in the Commissions of Array, and their Adherents; and that such Witnesses as shall be produced upon any of the Premises shall be examined upon Oath. Ordered, That there shall be an Order of Indemnity of those Persons that have assisted in the apprehending of Sir Lewis Dyves, in Bedfordshire. "Die Martis, 2 Augusti, 1642. "Whereas Fifty Thousand Pounds was, by a former Order, appointed to be paid unto Mr. Nicholas Loftus, Deputy Treasurer at War for Ireland, to be disposed of for the Pay of the Soldiers there, out of the Hundred Thousand Pounds promised to be lent by the particular Companies of the City of London; of which Fifty Thousand Pounds he hath received only Twenty-three Thousand Pounds; and the Twentyseven Thousand Pounds, Remainder of the said Fifty Thousand Pounds, cannot as yet be had out of those Monies: It is this Day Ordered, by the and Commons, That the Treasurers, appointed to receive the Monies that come in upon the Acts of Subscriptions for Ireland; do forthwith pay unto the said Mr. Nich. Loftus Twenty-seven Thousand Pounds, to make up the said Fifty Thousand Pounds, to be disposed of as aforesaid." It is this Day likewise Ordered, by the and Commons, That Five Thousand Pounds more be forthwith paid unto Mr. Nicholas Loftus, Deputy Treasurer at War for Ireland, to be disposed of upon the Lord Lieutenant's Warrants, for incident Charges, out of the First Monies that shall come in upon the Loan of the Hundred Thousand Pounds, promised to be lent by the particular Companies of the City of London." "Instructions for Sir John Curson, Knight, and Baronet, Sir John Coke, Knight, and Nathaniell Hallowaies, Esquire, Members of the House of Commons, and Committees to be sent into the County of Darby; and to Sir Henry Willoughby, Baronet, Sir George Greasley, Knight and Baronet, Sir Thomas Burdett, Baronet, Sir Symon Every, Knight and Baronet, Sir John Gell, Baronet, Sir Edward Leech, Knight, Sir Edward Vernon, Knight, Sir Samuell Sleigh, Knight, Thomas Greasley, Esquire, Francis Burdett, Esquire, Christopher Horton, Esquire, John Agard, Esquire, John Bullock, Esquire, Francis Munday, Esquire, Thomas Gell, Esquire, Guilbert Thacker, Esquire, Gilbert Clarke, Esquire, Randall Ashenhurst, Esquire, Francis Revell, Esquire, Henry Wigfall, Gentleman, Lionell Fanshawe, Gentleman, Rowland Moore, Gentleman, the Mayor of Derby, for the Time being, the Mayor of Chesterfeild for the Time being, and to the rest of the Deputy Lieutenants of that County, nominated by both Houses of Parliament, for the Preservation of the said County. Whereas it doth appear to the Lords and Commons now assembled in Parliament, That the King, seduced by wicked Counsels, intends to make War against His Parliament; and for that it is not improbable that, under Colour of raising a Guard for His Majesty's Person, or some other Pretence, the Knights, Gentlemen, Freeholders, and Inhabitants of the County of Derby may be drawn together: Therefore you, and every of you, shall take special Care, that the Ordinance concerning the Militia be forthwith put in Execution thorough the County; and the Sheriff, and all other Officers and Subjects, are hereby enjoined to assist you, and every of you, therein; and if any Person whatsoever shall levy, or endeavour to levy, any Soldiers, or to draw or keep together the Trained Bands, or other armed Forces of the said County, or any other Forces, by Colour or Pretence of any Commission or Warrant from His Majesty, under the Great Seal, or otherwise, without Order or Consent of both Houses of Parliament; you, and every of you, shall, in the Name and by the Authority of both the said Houses, require and command all Persons to forbear the Execution of such Commission or Warrant, and the same to be delivered up unto you, or any of you, to be sent to the Speaker of the House of Commons; and you, and every of you, are hereby required to draw together such of the Trained Bands, and other Forces of the said County, as shall be expedient for the suppressing of all such Assemblies, and for the apprehending of all or any Person or Persons as shall, after Admonition and Command by you, or any of you, made unto them, to forbear the Execution of any such Commission or Warrant, or the calling or gathering or keeping together of any such Forces or Assemblies, still persist in doing the same, likewise such disaffected Persons as shall be found raising any Parties or Factions against the Parliament, to be sent up hither, to answer such their Offences, as to Law and Justice shall appertain. "And you, and every of you, the aforesaid Members of the House of Commons, shall, in the Name of the Lords and Commons, require and command the Sheriff of the County of Derby, to publish throughout the said County the Declarations formerly published by both Houses of Parliament. "You, and every of you, shall further take Care, that such Resolutions and Orders of both Houses as have been, or shall be, delivered or sent down unto you, or any of you, be put in Execution; and shall require the Sheriff, Justice of Peace, and all others His Majesty's Officers and Subjects, to be aiding and assisting unto you, and every of you, for that Purpose. 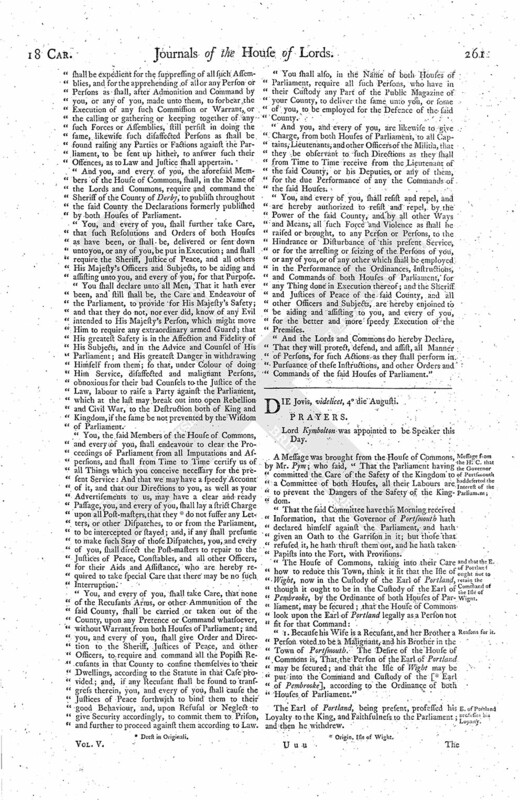 "You shall declare unto all Men, That it hath ever been, and still shall be, the Care and Endeavour of the Parliament, to provide for His Majesty's Safety; and that they do not, nor ever did, know of any Evil intended to His Majesty's Person, which might move Him to require any extraordinary armed Guard; that His greatest Safety is in the Affection and Fidelity of His Subjects, and in the Advice and Counsel of His Parliament; and His greatest Danger in withdrawing Himself from them; so that, under Colour of doing Him Service, disaffected and malignant Persons, obnoxious for their bad Counsels to the Justice of the Law, labour to raise a Party against the Parliament, which at the last may break out into open Rebellion and Civil War, to the Destruction both of King and Kingdom, if the same be not prevented by the Wisdom of Parliament. "You, the said Members of the House of Commons, and every of you, shall endeavour to clear the Proceedings of Parliament from all Imputations and Aspersions, and shall from Time to Time certify us of all Things which you conceive necessary for the present Service: And that we may have a speedy Account of it, and that our Directions to you, as well as your Advertisements to us, may have a clear and ready Passage, you, and every of you, shall lay a strict Charge upon all Post-masters, that they (fn. 3) do not suffer any Letters, or other Dispatches, to or from the Parliament, to be intercepted or stayed; and, if any shall presume to make such Stay of those Dispatches, you, and every of you, shall direct the Post-masters to repair to the Justices of Peace, Constables, and all other Officers, for their Aids and Assistance, who are hereby required to take special Care that there may be no such Interruption. "You, and every of you, shall take Care, that none of the Recusants Arms, or other Ammunition of the said County, shall be carried or taken out of the County, upon any Pretence or Command whatsoever, without Warrant from both Houses of Parliament; and you, and every of you, shall give Order and Direction to the Sheriff, Justices of Peace, and other Officers, to require and command all the Popish Recusants in that County to confine themselves to their Dwellings, according to the Statute in that Case provided; and, if any Recusant shall be found to transgress therein, you, and every of you, shall cause the Justices of Peace forthwith to bind them to their good Behaviour, and, upon Refusal or Neglect to give Security accordingly, to commit them to Prison, and further to proceed against them according to Law. "You shall also, in the Name of both Houses of Parliament, require all such Persons, who have in their Custody any Part of the Public Magazine of your County, to deliver the same unto you, or some of you, to be employed for the Defence of the said County. "And you, and every of you, are likewise to give Charge, from both Houses of Parliament, to all Captains, Lieutenants, and other Officers of the Militia, that they be observant to such Directions as they shall from Time to Time receive from the Lieutenant of the said County, or his Deputies, or any of them, for the due Performance of any the Commands of the said Houses. "You, and every of you, shall resist and repel, and are hereby authorized to resist and repel, by the Power of the said County, and by all other Ways and Means, all such Force and Violence as shall be raised or brought, to any Person or Persons, to the Hindrance or Disturbance of this present Service, or for the arresting or seizing of the Persons of you, or any of you, or of any other which shall be employed in the Performance of the Ordinances, Instructions, and Commands of both Houses of Parliament, for any Thing done in Execution thereof; and the Sheriff and Justices of Peace of the said County, and all other Officers and Subjects, are hereby enjoined to be aiding and assisting to you, and every of you, for the better and more speedy Execution of the Premises.